At first glance, it looks like an insanely prolific morning of birding: 4,136 Song Sparrows, 3,632 Dark-eyed Juncos, 3,362 Swamp Sparrows, 2,532 White-throated Sparrows, and 1,417 Hermit Thrushes. But the numbers don’t represent living birds. They tally the birds that died after colliding with one Chicago building from the fall of 1978 to 2004. And a frightening number of birds of other species were also killed. In all, 31,705 individuals from 141 species were found dead at the building. The story is similar across the country. Collision with manmade structures ranks second among causes of death among migratory birds in North America. (Habitat loss is No. 1.) Approximately 100 million birds die in collisions every year — some experts put the number as high as one billion. 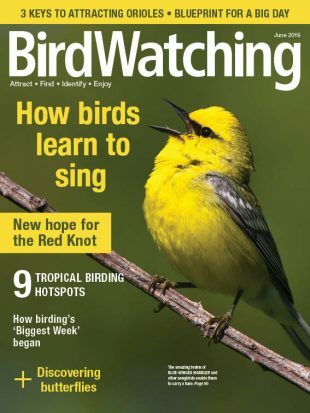 This article originally appeared in the April 2013 issue of BirdWatching. Scroll down to download the article as a PDF. Product listings and prices updated October 2017. Tall urban buildings aren’t the only obstacles migrating birds face, though. Most of the windows birds collide with belong to houses. 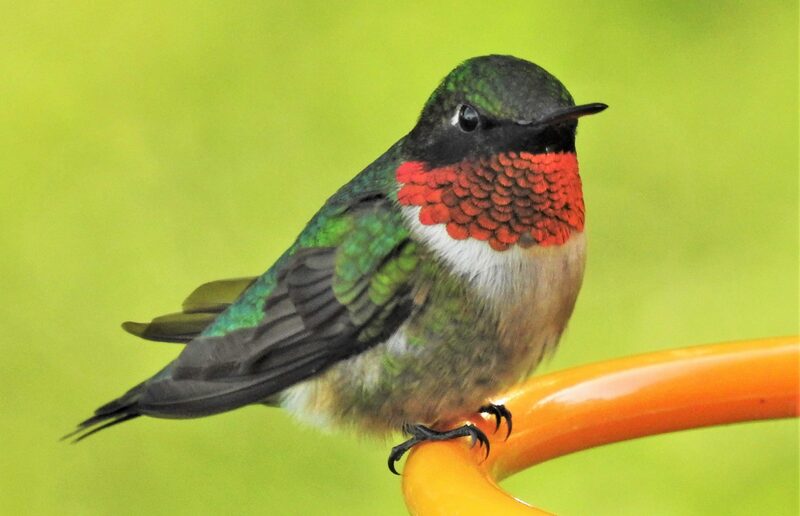 According to George Fenwick, former president of American Bird Conservancy, a home may kill a dozen or more birds a year without the owner being aware. 1. 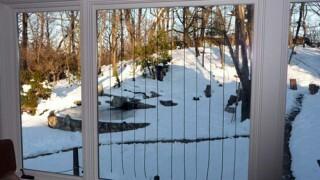 The window is reflecting the surrounding habitat, and birds can’t tell the difference. 2. 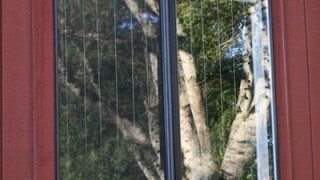 The window is transparent, and birds see through it to appealing objects on the other side. 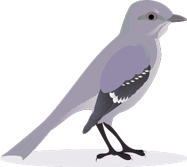 Even if the impact doesn’t kill a bird immediately, it may be injured or stunned, making it vulnerable to predation later. Nighttime presents its own challenges. Many birds migrate then, using natural light from the moon, stars, and setting sun as navigational tools. Our brightly illuminated cities and neighborhoods interfere with this behavior by letting artificial light leak into the atmosphere. The glow draws birds in, and they can become trapped. Once in a beam of light, they may be reluctant to fly back out, or become disoriented and pulled off course. Confused and exhausted, they often collide with buildings, homes, or each other. But it doesn’t have to be that way. Toronto, New York, San Francisco, and other cities have started lights-out programs aimed at persuading building owners to turn off lights from dusk to dawn during migration season. Results are promising. Lights Out Chicago, for example, has saved 10,000 birds annually. You can do your part to make the skies friendly for migrating birds by deterring window collisions and minimizing light pollution at your home. Below are some of the best products on the market for doing just that. 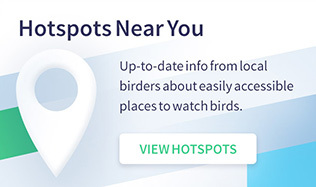 Taking the simple steps listed below — in addition to deploying the products described on this page — will dramatically reduce the chance that birds will be harmed in collisions at your home. 1. 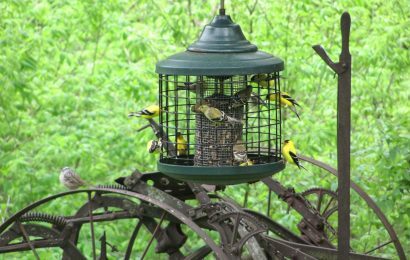 Move feeders close to your windows — 1.5 feet or closer. 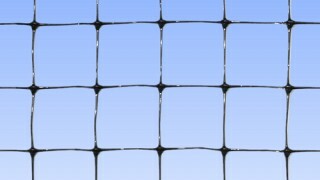 From this distance, birds won’t be able to build up enough momentum to hurt themselves if they do fly against the glass. 2. Close curtain and blinds when possible to break up the illusion of clear passage or reflected habitat. 3. Move houseplants away from windows. Birds may view them as refuges and try to perch on them. 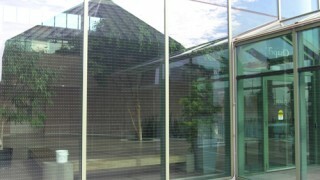 Barriers to mount in front of a window to prevent birds that fly into it from striking the glass. 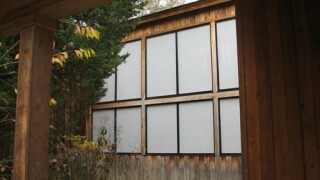 An attractive transparent black fiberglass screen that hangs loosely in front of a pane of glass, providing a gentle cushion for birds that strike it. 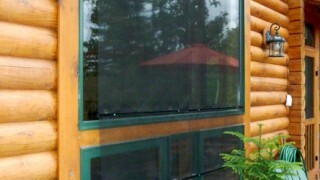 Screw hooks and suction-cup brackets, included with purchase, secure the screen to a window or sliding door. Custom sizes available. 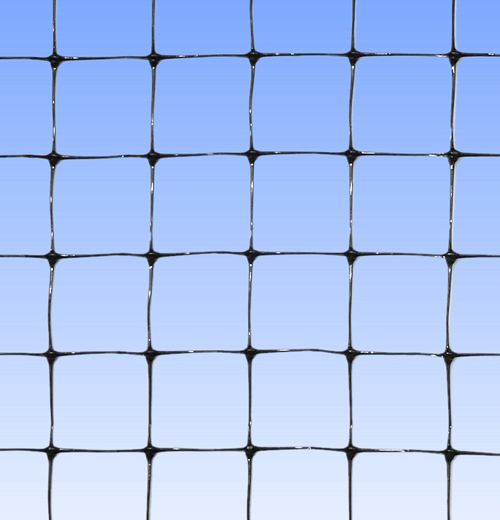 Image courtesy of Nixalite of America Inc.
Bird-exclusion netting made from durable, lightweight polypropylene, sold as PollyNet and Woodpecker Netting. Useful for keeping birds out of eaves or open spaces. Secure with net clips, hooks, or a staple gun. Hang the netting tightly at least two inches from the glass to provide a firm barrier that will keep birds from hitting the window. 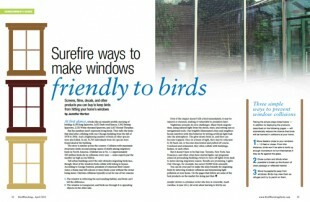 Antireflective vinyl or polyester films to apply to the exterior of a window to make it visible to birds. 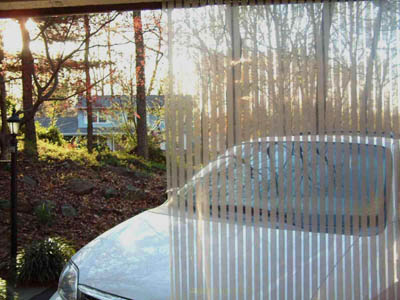 Covers the entire exterior surface of a window, reducing its reflectivity and transparency substantially, while thousands of small perforations in the film allow light to pass through to the interior. Ten percent of the purchase goes to the Fatal Light Awareness Program (FLAP) to help fund research to reduce bird-window collisions. Can be custom-printed. PRICE: Varies depending on size and product. 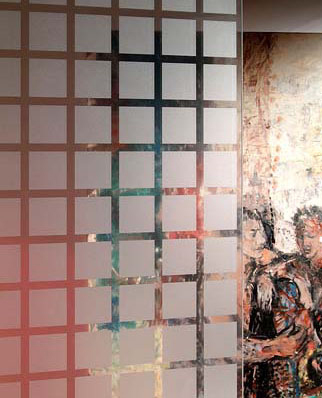 A decorative window film that does double-duty as artwork. More than 150 patterns and shades are available, from stripes to bamboo to frosted. Easy to apply and remove. Image courtesy of All Window Dressing, Etc. 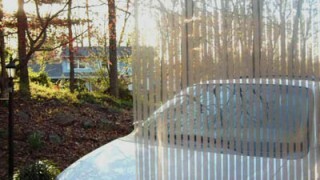 “Glass art for windows,” these patterned films stick to any smooth surface, decrease glare and UV light, and reduce reflections and the illusion of clear passage. Take care to select a design that offers adequate coverage. 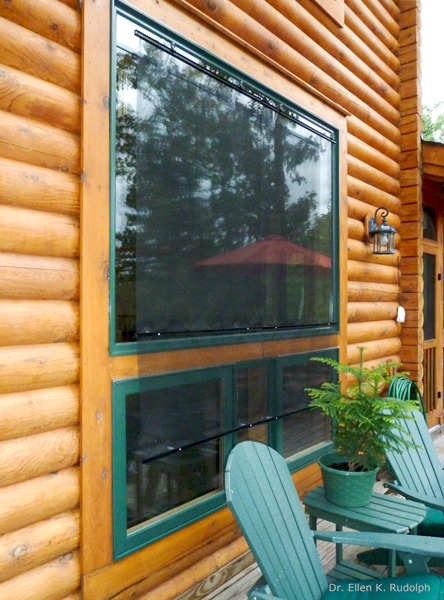 Vinyl decals and paint to apply to windows to minimize areas of clear or reflecting glass. 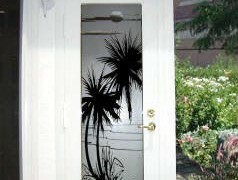 White static clings you can place on the inside or outside of a window, where they contrast with dark reflections of trees and surrounding scenery. Choose from a variety of nature-themed designs. Easy to apply and reusable. Available at your favorite birding-supply store or garden center. 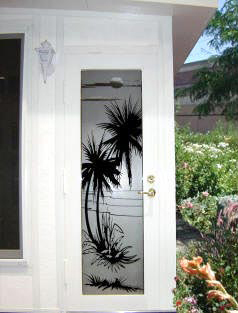 Vinyl decals that give windows, window corners, sidelights, and doors the appearance of etched glass. Available in a variety of natural, sporting, and artistic patterns. PRICE: From $3.50 to $32 depending on size. $75 for a full door. Widely available, long-lasting, and rainproof tempera paint can be applied with a brush or sponge. 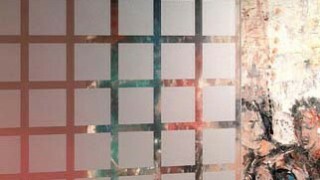 Make your own stencils, purchase them from your neighborhood art-supply store, or download them for free from www.spraypaintstencils.com or other websites. 1. 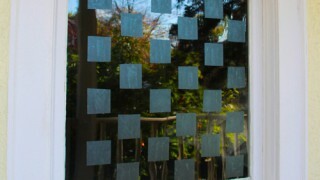 Use multiple decals; create a pattern that covers the window uniformly. Elements arranged in columns should be four inches apart. Elements placed in rows should be two inches apart. This is often called the 2 x 4 Rule. 2. 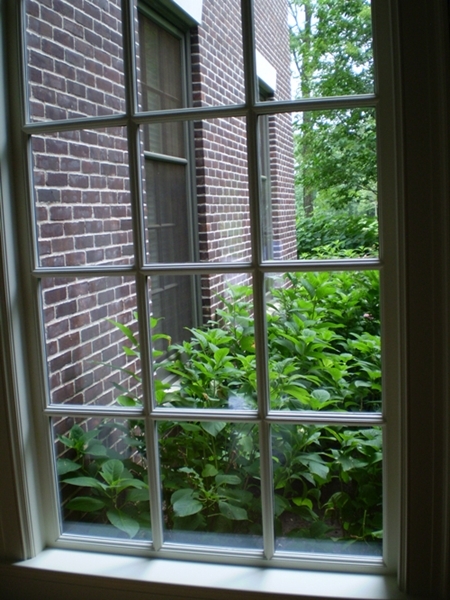 Elements should be at least one-eighth inch in width and should contrast as much as possible with the windowpane. 3. 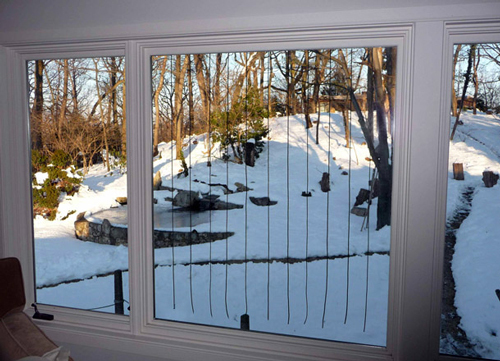 Patterns can be placed on the inside or outside of a window that is transparent. If it is reflective, the pattern must be applied to the outside. Curtains of nylon cords or monofilament lines to hang over a window’s exterior. Birds see these cords and try to avoid them. Ingenious and attractive, BirdSavers consist of one-eighth-inch-diameter nylon cords that dangle about four inches apart in front of a window’s exterior, where they are visible to birds, which avoid them. Velcro secures the hanging cords to the top of the window. 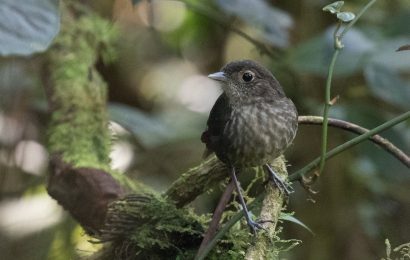 Recommended by Contributing Editor David Sibley and Daniel Klem Jr., professor of ornithology and conservation biology at Muhlenberg College in Pennsylvania, who has been studying bird-window collisions for more than 20 years. Instructions on the website describe how you can build your own. PRICE: Varies with glass width. $24 for five cords (for glass 21.25″-25.5″ wide). Proceeds support conservation programs at the Acopian Center for the Environment. 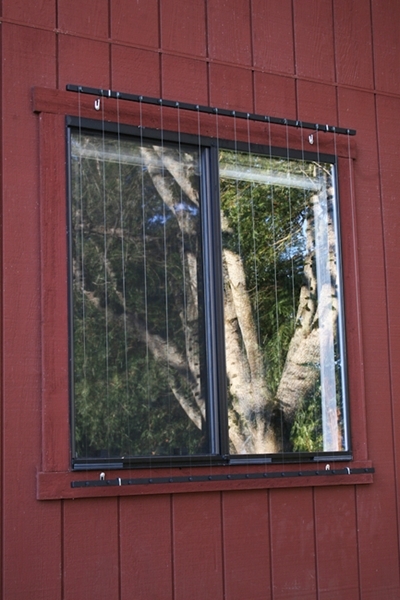 A preassembled curtain of taut monofilament lines strung three inches apart and five inches from the exterior of a window or sliding-door side panel. Birds see the lines and avoid them, while the space between the lines and glass gives birds that touch them a chance to spread their wings and brace themselves. Available in dark brown and white. Translucent tape to adhere to a window’s exterior. Birds see it and are warned of the glass, but light still passes through. 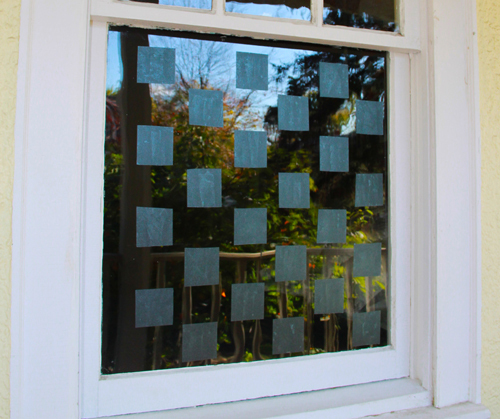 Small white markers are transferred from the tape to a window’s exterior, leaving an attractive, unobtrusive grid of dots that make the glass visible to birds while providing more than 98-percent-clear viewing from inside. Similar markers were recently applied to the exterior of the Consilium Place office complex in Toronto, the subject of a lawsuit over bird strikes last year. Each residential kit comes with 100 feet of marker tape, two measuring strips, and installation instructions. 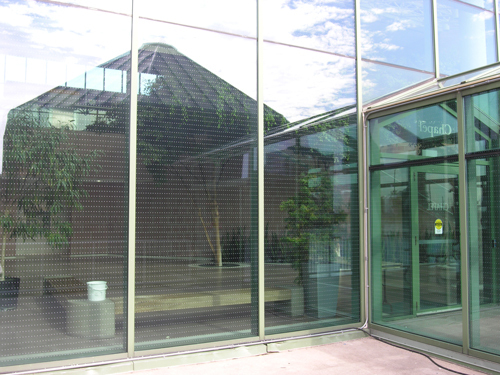 Designed and tested by American Bird Conservancy, BirdTape alerts birds to the presence of glass while still allowing light to pass through. Available in three-quarter-inch and three-inch widths. Simply cut to the desired length, remove the backing, and apply to a window’s exterior. 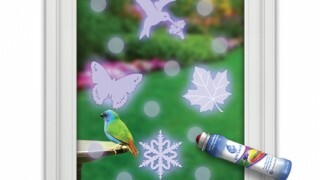 Decals, liquid, and specially coated glass that reflect ultraviolet light, which birds can see but we can’t. Decals cling using either static electricity or a low-tack adhesive. Each has a coating that reflects ultraviolet light, which birds can see but we can’t. When placed on a window’s exterior using the 2 x 4 Rule (see tips for using decals above), the resulting glow pattern deters window strikes. Choose from hummingbirds, butterflies, maple leaves, and other shapes. Available at your favorite birding-supply store. 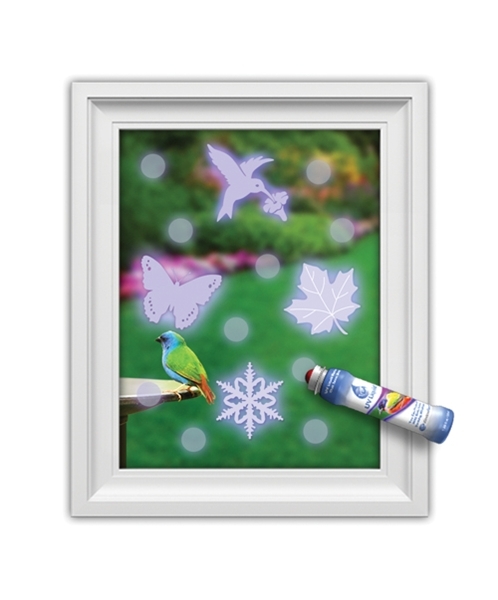 An easy-to-apply liquid that can be daubed on a window’s exterior and dries clear, leaving marks that birds can see. Use alongside decals for the best coverage and protection against bird strikes. Available at your favorite birding-supply store. PRICE: $19.45 for 1.5 oz. 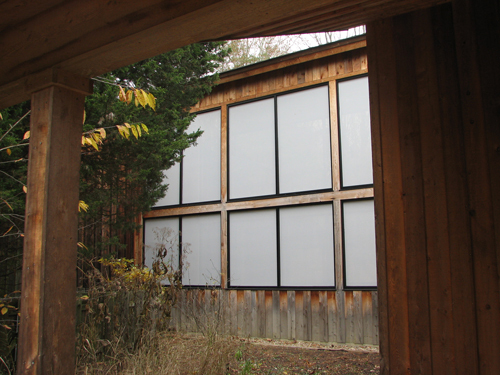 Tested by the Max Planck Institute for Ornithology in Germany and at American Bird Conservancy’s flight tunnel at the Powdermill Avian Research Center in Pennsylvania, Ornilux glass is laminated with a UV-reflective, patterned coating that is virtually transparent to our eyes but visible to birds. Available for new construction and window replacements as either laminated glass or a double-glazed insulated unit. PRICE: Contact Arnold Glas N.A. for a quote. One window decal in the shape of a hawk will not frighten birds. Shape is not important. 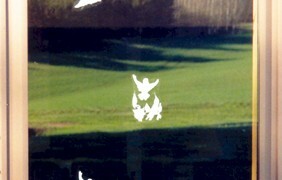 Affixing a single decal to a window will not deter birds. To lessen the area of exposed glass and help make a window visible to birds, use multiple decals (even multiple decals in the shape of a hawk). Birds learn quickly that a motionless plastic owl is not a threat. Common noise deterrents — high-frequency ultrasound, noise cannons, and recorded distress calls — are ineffective at preventing birds from colliding with windows. Some deterrents emit a magnetic field said to disrupt birds’ geomagnetic orientation and encourage them to avoid the area. Magnetic fields are not effective at protecting birds from window collisions. Shields, bulbs, and other items that prevent light from shining into the night sky, where birds migrate. This is one of the simplest ways to reduce nighttime collisions. Ideally, you would turn off all lights between dusk and dawn, especially during migration season — that is, from mid-February to the end of May and from mid-August to the end of November. 1. Use fixtures that are shielded, instead of globe-type models that spew light everywhere. 2. Choose downlighting over uplighting to keep from directing light into the night sky. 3. Use motion sensors to avoid steady-burning lights, and timers to ensure that lights aren’t left on longer than necessary. 4. Look for products that have been approved by the International Dark Sky Association, a nonprofit organization that works to preserve and protect the nighttime environment through environmentally responsible outdoor lighting. You can find lists of IDA-approved fixtures on the association’s website. Another effective step to consider is controlling the color of the light produced by your home. When it comes to the effects of light on birds, not all wavelengths are created equal. Red light and white light (which contain visible long-wavelength radiation) disrupt birds’ geomagnetic orientation. Blue and green contain less long-wavelength radiation and are much less disorienting. Jennifer Horton is a freelance writer who lives in Greenville, South Carolina. She has also written for us about learning to bird by ear.